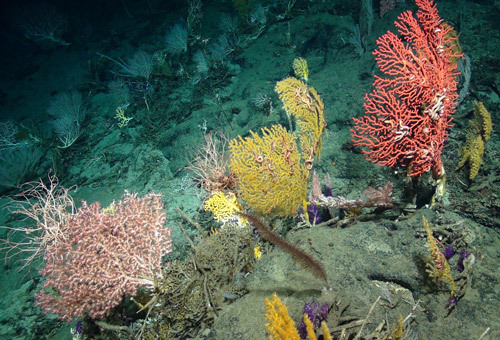 Scientists examining naturally occurring uranium levels in ancient deep sea corals have discovered new insights into how the major northern ice sheets retreated during the last major deglaciation on Earth. The research, carried out by a team from the universities of Bristol, Leeds, Cardiff, Woods Hole Oceanographic Institution and Colgate University, has been published in Science this week. Uranium is more than a source of energy and a material of nuclear weapon. In nature, it occurs in all rocks, and its radioactive decay allows us to use it to look at different processes that have happened in the past. Importantly, uranium comes in various types, called isotopes, which have different masses and different rates at which they decay – in nature these types include uranium-238, which decays to become uranium-234. When continental rocks are eroded they bring trace amount of uranium into the ocean. The 234U daughter isotope is more mobile than its parent 238U, so weathering has led to an ocean that has a 15 percent excess of 234U when compared to 238U. The study's lead author, Dr Tianyu Chen, from the School of Earth Sciences at the University of Bristol, said: "Subtle changes in the ratio in seawater have the potential to tell us about past changes in weathering. "This is important because it is the input of material from the land to sea that provides the nutrients needed to support life in the ocean. "However measuring these ratios is not easy because the changes are small, and the record is not easily preserved. It turned out that reliable reconstruction of past seawater 234U/238U was quite challenging." The team looked at 234U/238U reconstructions of the last 50,000 years based on the exceptionally well-preserved deep-sea corals from the equatorial North Atlantic and Pacific Galapagos platform. Their results reveal a detailed record of 234U/238U in the oceans which provide new insights into how the major northern ice sheets retreated during the last major deglaciation on Earth (about 18,000 to 11,000 years ago). The authors hypothesized that the increase in excess uranium-234 during this time period was caused by the melting from the bottom of major ice sheets – it is in these areas where the large ice sheets has powdered the underlying rocks. During the coldest part of the glacial this ground up rock was frozen into the ice for thousands of years – but as the Earth warmed, the ice sheets gradually started to melt from the bottom – releasing uranium out into the sea long before the 120 metre sea level rise from the major period of ice melt. The authors speculate that this ‘basal’ melting may also have released significant amounts of nutrients to the oceans. Dr Chen added: "Previous interest in the excess uranium-234 in the ocean has stemmed from its importance in determine the age of fossil corals. "Fossil corals from reef areas have been used to establish the timing of major sea level change in the past. Our study puts new constraints on how these ages are calculated and verified. "A surprising result was that the Atlantic and Pacific records are different – only converging half way through the deglaciation. "The timing of this convergence lines up with other evidence that suggest a major change in ocean circulation – to a world that looked more like today than the previous glacial period. "We observed a clear 234U/238U difference between the Atlantic and Pacific about 17,000 years ago, but such differences vanished after the abrupt resumption of the Atlantic overturning circulation." The authors believe their study has fundamentally changed our understanding about the behavior of U isotopes in the ocean, with importance for paleoclimatic reconstructions of nutrient fluxes to the oceans and U-series dating of marine materials. Two University of Bristol undergraduate students were involved in the study through their final year thesis work. Matthew Beasley, an MSci student in Geology, explored how uranium behaves in high latitude systems – involving laboratory studies of how glacial rocks behave when they weathered, as well as exploring the history of uranium on land and in the sea. Louis Claxton, also a Msci Geology student, spent his third year at the University of California on the Bristol study abroad exchange program. When he returned his final year research project examined the history of the Tropical Pacific during times of major climate change. A surprising finding of his work, and a critical piece of the published paper, was that the uranium history of the Pacific Ocean is different to the Atlantic. Funding for this project came from the European Research Council.